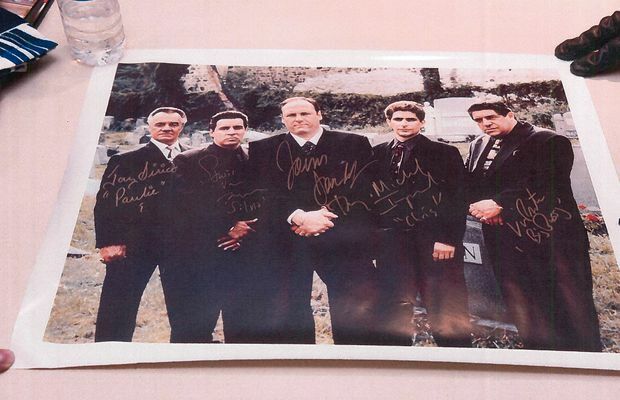 In a search of Domenico Violi's home office, police found a signed poster of the cast of The Sopranos. Antonio Nicaso is an award-winning, bestselling author and an internationally recognized expert on organized crime. He teaches Social History of Organized Crime and Mafia Culture and the Power of Symbols, Rituals and Myth at Queen’s University. In November of 2017, police arrested Domenico Violi, a Hamilton father and salesman, on drug-trafficking charges. Mr. Violi’s trial exploded his reputation: Courts heard that he had told an undercover agent that he had been promoted to underboss of the Buffalo-based Todaro crime family – “the No. 2 man in charge of the 'whole thing,’” he said in an audio recording – one of the North American Mafia families often referred to as La Cosa Nostra. In Mr. Violi’s own words, he and his crime family were taking over the whole city of Hamilton with the bikers. He had participated in an initiation ceremony that took place in a Hamilton hotel in the presence of a representative of the Bonanno crime family from New York, in an effort to solidify relations with American families; in the 1990s, Montreal Mafia boss Vito Rizzuto, with the support of the Musitano brothers, masterminded the elimination of the Ontario representatives of La Cosa Nostra, creating an independent Canadian Mafia. Mr. Rizzuto’s death, from lung cancer in 2013, sparked a full-fledged violent mob war in Canada, even as the Mafia’s usual corrupt actions, from laundering money through knowledgeable professionals or purchasing real estate through shell companies, continue. And alongside all that cinematic-feeling drama, Mr. Violi reportedly lived the Mafia life. In a search of his home office, police found marijuana, a brick of hash, bundles of cash, several computers and cellphones, ledgers, a receipt booklet, a debt list, business cards with a list of police vehicles, a police vehicle tracker, two boxes of ammunition wrapped in a T-shirt – and, also, a signed poster of the cast of The Sopranos. That discovery – and the ensuing investigation, too – highlights how, even as technology has infiltrated every corner of everyday life and progress seems to happen exponentially, the tropes, business strategies and rituals of the Mafia seem to remain untouched by time. But then again, it’s no real surprise that Mr. Violi was a fan of the acclaimed HBO series. Fiction, after all, is what makes the Mafia attractive – both the fiction created by the Mafiosi themselves to legitimize their lives, and the fiction created by Hollywood and the media to make them look even more attractive and exceptional than they themselves could ever have imagined. Without these twin fictions, the perception of the Mafia as an honourable society of heroic figures would dissipate, its allure easily excised from the domain of popular culture. Fiction is the main reason why police crusades against the Mafia have proven largely ineffectual in eradicating it from the social radar screen. People have always used fiction as a mirror of reality, combining credible factual elements with imaginary situations and incidents. And for the Mafia, fiction masks the truth: That it is a ruthless organization, its concept of family twisted into something criminal and violent. In 1972, Francis Ford Coppola’s The Godfather became an overnight hit, mainly because it portrayed “men of honour” as defenders of the traditional concept of family. This was appealing for people at the time; by the early 1970s, the United States had entered into a postmodern mindset, a worldview that challenged, and continues to challenge, traditional family values. The Godfather reassured audiences that the traditional family was still valid, no matter how deadly Mafia families might actually be. They espoused the principle of the family, no matter how brutal they were. The image of mobsters as “men of honour and tradition” became iconic throughout the United States, and as they became embedded into American popular culture through esteemed pop-culture classics such as The Godfather and Goodfellas, it created an aesthetic tone and cultural mythology, and allowed villainy to falsely be cast with a hero narrative. The real Mafiosi know how to deploy that tantalizing blend. Mafia culture has always been aware of the emotional power of symbolism, even before Hollywood entered the picture. The Mafia has always portrayed itself as an “honourable society,” adopting a code, called omerta, based on symbols, rituals, rites and myths, that allows it to endure across generations. With this code, murder becomes divine justice, violence a sacred battle and betrayal a sacrilege. Without the intoxicating mythology, murder would just be gutless homicide, violence brutal savagery and betrayal, a common banality. The number of research studies on the social conditions leading to organized crime membership is staggering, as are the theories put forward to explain the allure of criminal lifestyles, from socioeconomic variables to a latent “violence instinct” in the human psyche. These frameworks seem wanting: Socioeconomic status and even education seem to play diminishing roles in attracting young people into the lure of gangs today. But if indeed gangsterism is, as film critic Robert Warshow suggests, a form of art, based on a look, walk and talk that exudes power, control and enjoyment, then it’s these forms of symbolic self-construction – including clothing and tattoos – that Hollywood and the mass media both tap into and influence the Mafia in turn. There really never was a Mafia dress code, for instance, but there is one now – and it looks suspiciously like the one seen in movies about fictitious mobsters. Missing the importance of symbolism means we miss the root causes of Mafia culture. This can be dangerous: For a long time, it was believed that the Mafia was an organization linked to Southern Italian ethnicity, a questionable idea of otherness that has generated controversial sociological theories, such as the “alien conspiracy” – the idea that the immigrants brought crimes with them. But the Mafia is not a virus that infects healthy territories: It is a culture that grows by spinning its own alluring tales, but is also, at its core, about networking. Indeed, it is the upper world – inhabited by upright lawyers, chartered accountants, brokers, bankers, bureaucrats, politicians, police officers, judges and labour union representatives working legitimately – that sustains and supports the underworld. During a conversation with an undercover police agent, Mr. Violi spoke about paying off a judge and being well-connected to important people. His brother Joey pleaded guilty to drug-related charges and last June was sentenced to 16 years in prison. At his trials, character reference letters were submitted by the head of the local paramedics union, as well as a hospital manager and even a priest; the former head of the Hamilton airport volunteered to be a surety. “Human capital” or “social capital” – the ability to count on co-operation with outside subjects – is the backbone of the Mafia’s power. Without them, the Mafia would be like milk without lactose, or coffee without caffeine; the violence inherent in criminal organizations tether themselves essentially to power. That is what the Mafia is all about – it is core to its established image – and that is why it is very difficult to disrupt it internally or externally – especially if there is no political will to fight it. For Canada, the fight against Mafia crimes has never been a political priority. Legalizing marijuana or promoting a former police chief to federal minister who is responsible for the fight against organized crime won’t help. We talk about the Mafia only when someone is killed or someone is arrested or convicted. Often, talk shows appease audiences for entertainment, rather than legitimate interest in building concern and awareness. The money generated by drug trafficking is appealing to many, especially to the banking and financial world. In 2016, a bank – unnamed at the time, but later revealed to be Toronto-headquartered Manulife – that failed to report 1,200 suspicious transactions was fined only $1.15-million. This was the first and only time a bank has been penalized for this kind of offence. A 2017 report from Transparency International, a Berlin-based organization that works to stop corruption around the world, highlighted a loophole in Canada’s laws that could facilitate money laundering, particularly in the real estate sector: “An influx of overseas capital is one of several causes of rising property prices, but the extent and impact of foreign investment remains unknown since very little data is collected on property owners. Individuals can use shell companies, trusts and nominees to hide their beneficial interest in Canadian real estate.” Nowadays, criminal organizations tend to gravitate to jurisdictions with weaker standards. In Canada, foreign companies can buy property without providing any information about their real owners or their corporate structure, only a title holder which can be simply a trust or shell company. Research by Transparency International Canada shows that this practice is most prevalent in the luxury property market. Alfonso Caruana, a notorious drug trafficker, once said that Canada was the perfect country for criminals – aside from the weather. Nothing’s changed about the cold. Or the criminals.